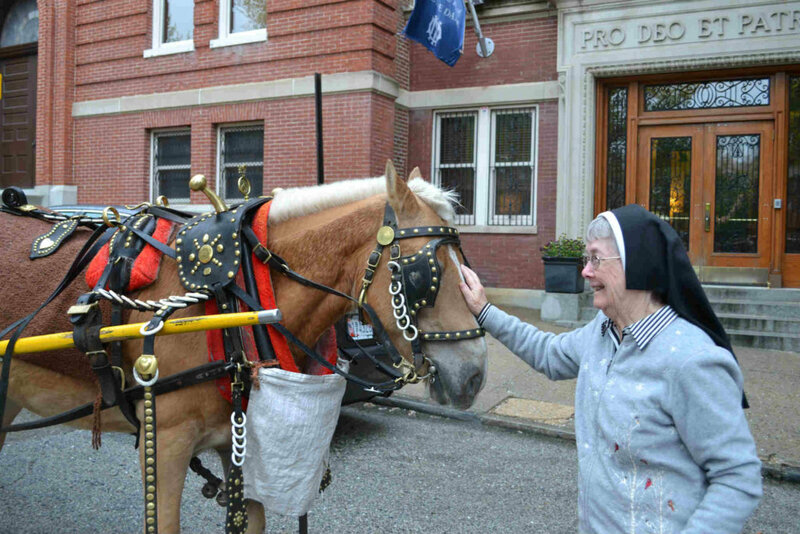 When School Sister of Notre Dame Patricia McCarron was a student of East Baltimore’s Institute of Notre Dame in the late 1970s, Sister Hilda “Hildie” Sutherland was the school representative who had an uncanny knack for being ever-present. As students stepped off the bus in the morning, it was Sister Hildie who wished them each a good day, Sister Patricia remembered. When they were leaving after basketball practice or a club activity, it was the same diminutive School Sister of Notre Dame who offered them a friendly smile and a word of encouragement on their way home. And when visitors approached the historic building, Sister Patricia said, Sister Hildie warmly welcomed them at the school’s entrance. After giving more than six decades of her life to service at IND, Sister Hildie died March 14. The Baltimore native had fallen ill three days earlier at IND and was rushed to the University of Maryland Medical Center in Baltimore. Just 10 days shy of her 87th birthday, Sister Hildie had still been an active volunteer at IND even though she officially retired in 2016. Few figures have been as intertwined with an institution as Sister Hildie. Born Marjorie Helen Sutherland in 1932, Sister Hildie was one of nine children. Her mother died while giving birth when Marjorie was in first grade, according to information provided by the School Sisters of Notre Dame. 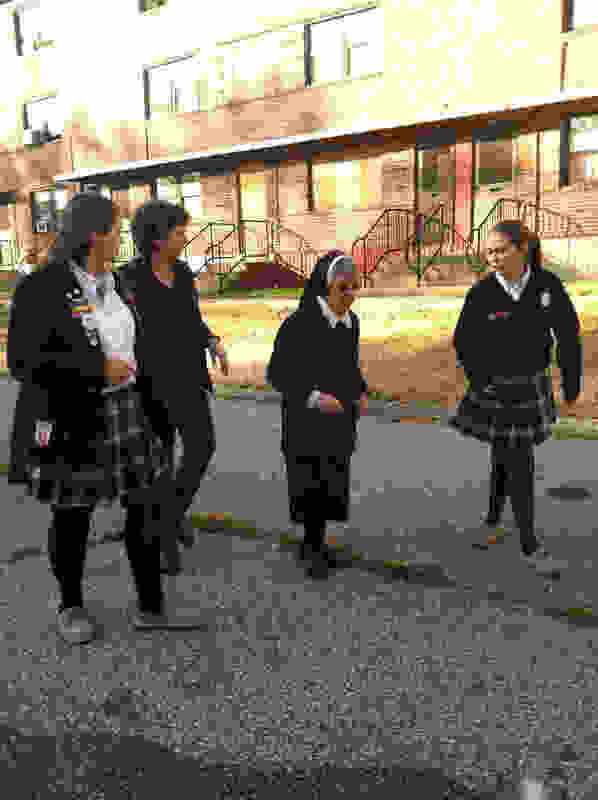 According to the School Sisters, Sister Hildie was inspired to become a School Sister after running errands for the teaching order and getting to know them while visiting School Sisters at St. Thomas Aquinas School in Hampden. Sister Hildie, who attended public school, entered the religious community Aug. 28, 1949, taking the name of Sister Hilda Marie, the headmistress at St. Mary’s who cultivated her religious vocation. During her candidacy, Sister Hildie lived at IND, which then housed the religious community’s motherhouse. After professing her first vows in 1953, she ministered in Pennsylvania and New Jersey before returning to IND in 1954, according to the School Sisters. Sister Hildie initially provided upkeep of the convent and worked as an aide at Ss. James and John School in Baltimore. Over the next several decades, she became a fixture at IND – cleaning, cooking, managing the bookstore, serving as director of housekeeping, director of hospitality and director of plant operations and more. Kathy Hobart, who taught at IND for 14 years and coached badminton and junior varsity basketball while assisting with varsity basketball, said Sister Hildie had a deep sense of compassion. Hobart noted that Sister Hildie had a good sense of humor, recalling how students loved to record video interviews with her. One of those interviews shows students teasingly asking Sister Hildie if she ever had a boyfriend. Hobart was part of a team of IND supporters called “Hildie’s Elves.” Every Thanksgiving break, the volunteers helped Sister Hildie put up Christmas trees and hang Christmas decorations throughout the massive IND campus. “Hildie’s Helpers,” an IND outreach during Thanksgiving, Christmas and Easter that provides tons of food, clothing and other items to those in need in the communities surrounding IND, was begun by Sister Hildie in 1959 – the same year she professed her final vows as a School Sister. 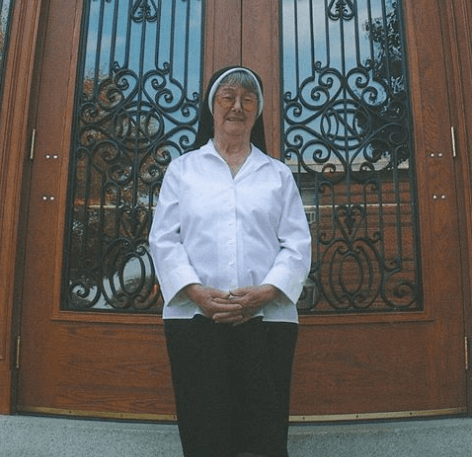 It had its roots in service to the poor that Sister Hildie provided in 1949 as a 17-year-old aspiring nun who was charged with reaching out to those in need surrounding her motherhouse. In a 2014 interview with the Catholic Review, Sister Hildie noted that 40 percent of the IND student body are involved in the outreach named in her honor. “It makes me relax, rejoice and thank God that we helped somebody else put food on the table,” she said. Michael Reeb, an English teacher at IND, knew Sister Hildie for nine years after transferring to the school following the closure of Cardinal Gibbons School in Baltimore. He noted that the nun was beloved not only by the school community, but by many in the surrounding neighborhoods. During the Baltimore Riots of 1968 following the assassination of the Rev. Dr. Martin Luther King Jr., a neighbor put a black band around IND’s front door emblazoned with “Sister Soul,” he said. The school was spared harm. “She was their neighbor and they treated each other as such,” he said. Reeb noted that in the wake of Sister Hildie’s death, students are praying the Hail Mary in a special way. The traditional Catholic prayer was Sister Hildie’s favorite, he said. Neuberger recalled how she especially loved eating Sister Hildie’s tuna sandwiches. Sister Patricia said her friend did everything for love of the students and love of the Lord. Memorial contributions in memory of Sister Hilda Marie Sutherland, SSND may be directed to the Institute of Notre Dame (indofmd.org). 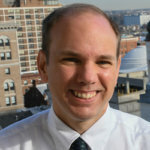 Emily Rosenthal contributed to this story.